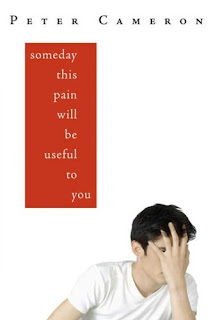 Someday This Pain Will Be Useful to You is an offering by Peter Cameron, that lingers on a few days' life of James Sveck, an 18 year old boy. James is days away from his new life in college, and the story surrounds the idea and issues of him not wanting to continue his studies, but to move away to an isolated area, to live in his dream house. James has to deal with his mother who has just broken up with her newly wed husband, and an older sister who is having a relationship with her married professor. James is keen to be close to the worker hired by his mother to take care of her gallery. I was so eager to read this book, due to the good comments and reviews by several readers, that not able to find a copy was upsetting. And upon getting it for my birthday, I sat myself down and read. And read. And I was... disappointed. I do not know the big deal with this book. I find James's character irritating. He is nothing but a proud, spoilt rich kid who thinks highly of himself and lowly of those all around him. No one is good enough for him, and even the slightest thing he likes - the dream house, becomes a turn-off just because of the real estate agent cannot be impressive enough to convince him. Kids around his age are not good enough for him, and practically no one is, except for the gallery worker. This was supposed to be where the gay plot steps in, but actually, the book hardly touches on it. It is like a cheap ploy to get attention, perhaps from the gay community to buy this book by making the lead character gay, but never gay enough. If it is not for the book cover, I would have been glad to get rid of the book.